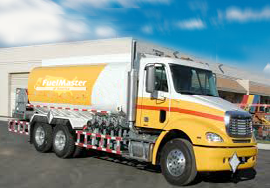 With a company-owned, modern fleet and expanded delivery, FuelMaster offers fuel transport service throughout the entire mid-west region. We deliver dedicated transport loads of jet fuel, aviation gas, diesel fuel, gasoline and ethanol to customers. FuelMaster is has established itself as a reliable logistics and transportation solutions provider in the liquid bulk industry. FuelMaster Transport takes good adavntage management software to manage its inventory, operations in house to reduce runouts,and over- and under-payments etc. Reliability in regulatory and greater accuracy has been attained using its inventory management system.Customers are offered aditional benefits like BOL/PO Tracking ,Load Offering etc. We have and will always conducted its operations in accordance with the law. We take great pride of our good name and fame within the communities that we serve. .
FuelMaster Transport can customize the transportation and delivery program according to customer's need so that they could run their business professionally and in profitable way.